Will having braces affect the way I play an instrument? Many of our patients are musicians who play instruments in their school bands. Some have come to us before getting braces with questions about how braces will affect the way they play. Most instruments played with the mouth will require a short adjustment period, but once you get used to the subtle differences, you can achieve the same quality of sound as before! Instruments such as the flute and piccolo shouldn’t be a problem at all with your braces. It may take a day or two to get used to your new mouth. You may need to clean out the head-joint more often as extra condensation may occur. Clarinets, saxophones, bassoons and oboes may have a day or two of a transition period, as your lips will need to adjust. 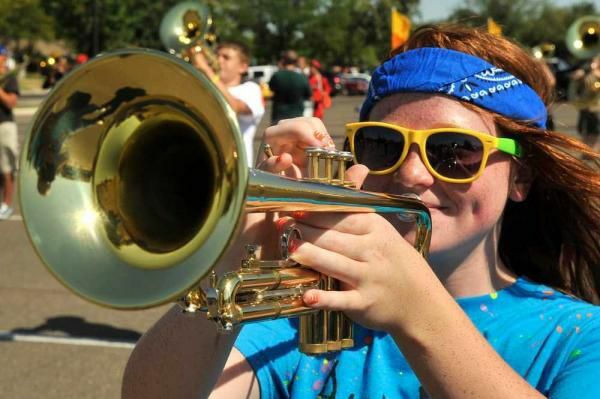 French horns, bass, tubas and especially trumpets may take a little longer to get used to with braces. You’ll need to acclimate to the way that air flows now through the position of your lips, since any minor tweak can create a whole different note. It may take a week or two to fully adjust to the changes, but you should be making beautiful music in no time! If you still have concerns about the way you would perform with braces, consider Invisalign as an alternative. With Invisalign you can simply remove the trays when you play your instrument. McFarland Orthodontics offers all the latest and greatest in orthodontic technology to suit your lifestyle.